Today I embark, Cruceros Australis. Here is a huge bummer—check out at the hosteria is 10:30am. My ship paperwork says I can check in for the cruise between 12pm-4pm, so I aim for 3pm. I check-in at an office in town, they tell me to show up at the pier at for boarding 5:30 or 6:00. You can only walk the streets of Ushuaia for so long it’s just one main street, it’s really tough trying to kill 6+ hrs. I had thrown everything into my suitcase, I didn’t even have a book to read. I am starting to think that traveling solo is not all that it’s cracked up to be. My dining arrangements on ship is at a table with all French speakers. Wow, this makes dining a little stressful. I don’t know what I’m supposed to do, stare at the ceiling, look around the room and chew my nails, or pretend that I am listening and just smile. They seem nice, but I can’t understand a word. This is where my husband that speaks several languages would come in handy. Then on top of that, they announce at dinner that there are 20 nationalities present on board. They name off each country and people cheer. They say” United States”—the room is silent, I wave my napkin and my table cheers for me. The host announces again “United States”, I wave again—that’s it, I’m the only American on the ship! Another beautiful morning, they have us meet at 7:10am to take the zodiacs to Cape Horn. So cool– we walked up a ton of steps to a monument/statue to the southern most tip of land on the continent (AKA Lands End). Back to the ship for breakfast. It was a leisurely day of documentary films, reading, and watching the dolphins jump along the side the boat. Lunch is my favorite part of the day. I love having a buffet, such a variety of strange things, I have to try everything. So many things I cannot identify, I was eating a salad, I think if was fava beans? They were huge and looked like clams, but tasted like beans. 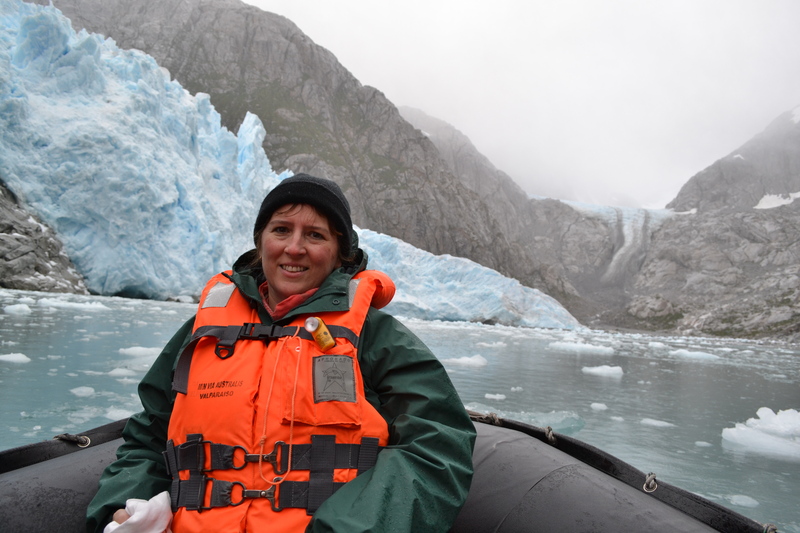 This afternoon we went out in the zodiacs again to see Piloto and Nena glacier. This glacier was sky blue, unbelievable. 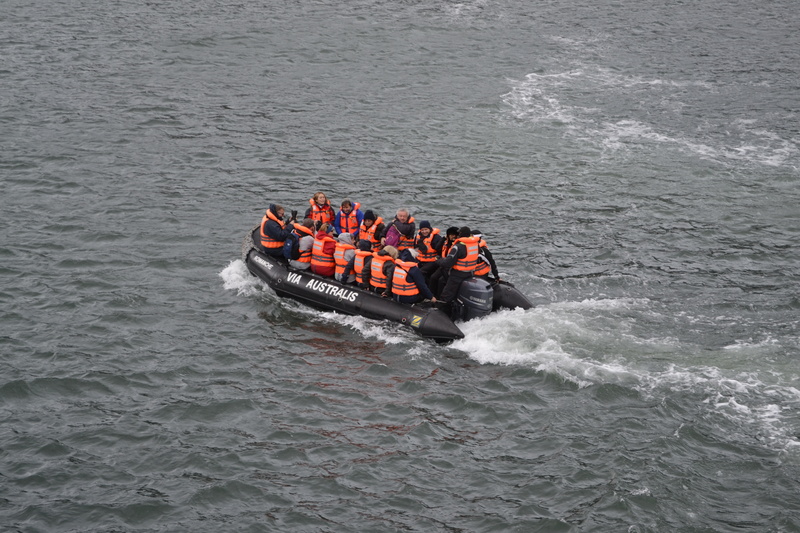 On the way back to the boat I saw a sea lion jump out of the water right next to our zodiac, I was pointing and oohing, no one saw it except for one guy who backed me up. I think people thought I was making it up. I have been sleeping fantastic while on ship, I’ve even been taking 2 naps a day. It does get a little rough, as I write the ship is tossing quite a bit. I did need a Dramamine today.